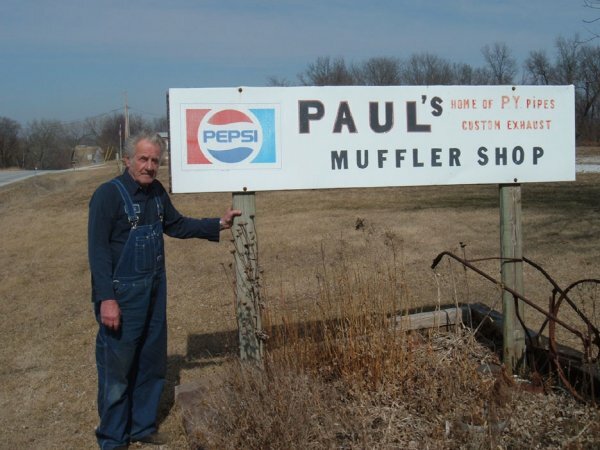 La Harpe: Paul "PY" Anderson opened his muffler business December 1, 1973 in the old Case dealership on the east side of the park. In 1975 he moved the business to the building just north of his old location. In 1976, Paul decided to purchase land and build his own shop. This brings us to his current location at 313 N State Hwy 94, which he moved into in May 1977. He is open Monday thru Friday from 8 to 5. PY can do it all, from custom exhaust on antique and collector cars to your everyday exhaust work. He has been working on cars in some way since he took his first job when he was 14 with Maynard's Conoco. One of his most memorable experiences was when Dale Owings landed his helicopter in his lot to have exhaust work done. When the job was complete Dale tried to give PY a ride, but he declined. "If you had known Dale, you would know he was really going to take me for a ride." PY does get a little help though. His wife Bev said she does the hard work around the shop, which is keeping the books. He also has two children, Dave Clover and Cindy (Tod) Irish and three granddaughters, Jenny, Lisa, and Tesla. In his free time you will still find PY in the shop. His love is cars and anything that goes along with them. If not in the shop he can be found at car shows, cruise nights, swap meets and the races. He also enjoys collecting model cars. Most recently he has started restoring his '48 Chevy that he has had for 27 years.